No fancy footwork – basic STEP patterns with options shown for regulating intensity. A great new studio workout utilizing a ballet barre, light dumbbells, and bands to help build long lean muscles. 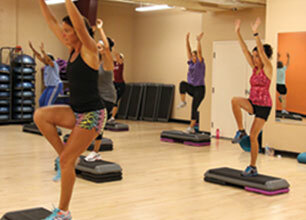 This class focuses on small, precise muscle movements and isometric holds to sculpt, strengthen and stretch muscles. 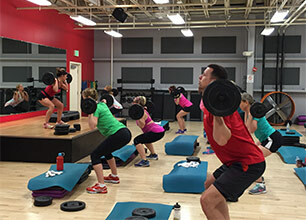 It’s the “original” Barbell class that will sculpt, tone and strengthen your entire body, fast! 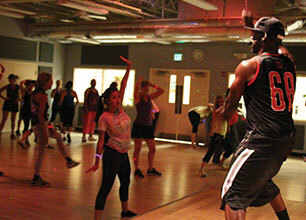 Think dance school…the cardio workout where you are free to enjoy the sensation of dance. An addictive fusion of the latest dance styles and hottest new sounds puts the emphasis as much on having fun as on breaking a sweat. This indoor cycling class takes you on the road, flats, hills and sprint drills will improve your overall fitness even in the “off season.” “60” indicates a 60 minute class with exercises designed to develop body awareness, stability, and confidence in movement. If you’re looking for a gentle approach to exercise, then this class is for you! Fundamental cardio patterns are combined with exercises designed to develop body awareness, stability, and confidence in movement. Not too basic, not too extreme…just right. Intermediate step patterns provide just the right amount of flavor to your cardio workout. Intervals of cardio step training and conditioning blend together to create a challenging and dynamic workout. Not your traditional strength training….get strong and lean with alternative training techniques and tools. A total body blast that changes the way you train. *Registration is required for the AM classes only. For safety reasons, 24 registered class participants will be the maximum. This will allow for a better quality workout and class experience. The Zumba® program fuses hypnotic Latin rhythms and easy-to-follow moves to create a one-of-a-kind fitness program that will blow you away. Ditch the workout, join the party! Lose up to 20 pounds in 30 days! o	There are 7 different hormones that can make it virtually impossible for you to lose weight, especially if you’re over the age of 35. 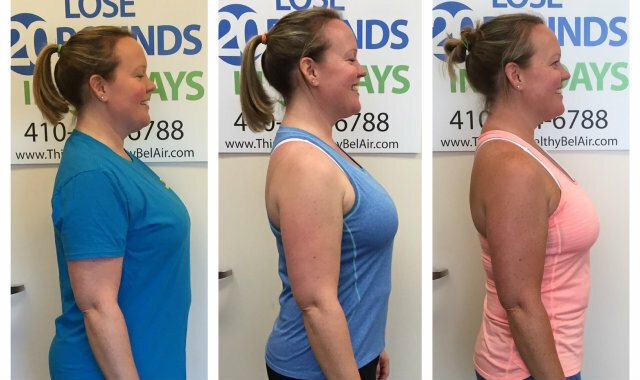 The 20 LBS IN 30 DAYS FAST TRACK PLAN addresses those hormones and guarantees you will lose that weight! * *Results may vary based on each individual.